The ultimate comfort food to accompany your favourite Sunday roast on a cold, Winter's day. 1. Place potatoes in a pot of cold water, add salt and bring to the boil and cook them until they are soft and slightly resist a knife. Avoid overcooking because they will get too mushy. 2. Pour olive oil onto a baking tray and spread it around evenly with a brush. 3. 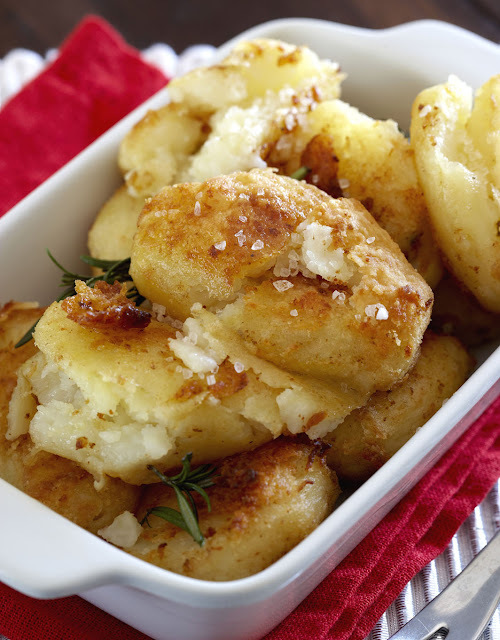 When the potatoes are done (about 12 minutes after boiling), strain and put them on the tray, cut the potatoes from the top into quarters – then using a large fork crush them down so they flatten a bit. Don’t mash them. 4. Drizzle the tops with olive oil (you should have slight puddles of oil when you are all done, but not a bath) and then add a heavy sprinkling of salt and fresh ground pepper, as well as some fresh rosemary, chopped garlic and a light sprinkling of balsamic vinegar. 5. Put the potatoes into a preheated oven 200ºC. Let them cook for about 35 minutes checking regularly to make sure they don’t go burn. They should come out nice and crispy. 6. Serve them with an additional sprinkle of salt and a sprig of fresh rosemary as a garnish.